Domo Japanese Country Foods Restaurant -- Happy New Year! As the end of the year approaches and a New Year begins, we wish to thank you for your support of Domo’s “Dine at Domo and Feed the World” campaign this year. With your support in 2011, we were able to supply over 12 tons of rice to orphanages in Bangladesh, the Philippines, Myanmar and more, and built two new AHAN Learning Centers in the Philippines and Thailand. Your support has been put to very good use for people in need around the world! Video documentaries on these projects and more are available online. Click here to view. I very much appreciate all of your support in 2011 and look forward to working together with all of you in 2012 ! Thank you! AHAN Mindanao Learning Center, completed in March 2011. Currently housing and feeding victims of recent massive flash flooding in Mindanao, Philippines. 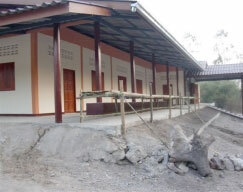 AHAN Thailand Learning Center; Bilay House Orphanage, competed in December 2011. 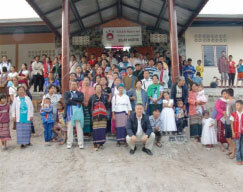 A facility for the care Myanmar refugees and orphans in Thailand. Gaku Homma Sensei at the Bilay House opening December 13th, 2011. We don’t have the game on TV, which makes Domo a cozy retreat on Bronco Game Days! Come down and join us for a relaxing meal with great service on Bronco Game Day and we will treat you to one complimentary nigori sake; a Japanese country-style traditional unfiltered sake! *complimentary sake served per person with entrée order. Must be 21 years of age with ID. My hometown of Akita in the Tohoku Region of Northern Japan, is located about the same latitude as Denver so the weather is very similar. The trees change color in fall about the same time in Akita, but the colors of the changing leaves are filled with hues of red, orange and yellow; similar to the colors of fall on the East Coast of the US. In Japan, fall is a time to celebrate the most delicious bounties of the harvest. In Japanese, this season is called "Shoku Yoku no Aki" or the "The Appetites of Fall". The fall harvests of fruits, vegetables, mushrooms highlight the season, and of course the first rice wine sake of the year matures in the fall adding to the rich tastes of the season. Open now for 16 years, everyone calls our restaurant "Domo" but actually the name is "Domo Japanese Country Foods Restaurant". Domo specializes in local, economical, Japanese country foods in a relaxed and casual authentic Japanese country-style atmosphere. Domo takes great care and a lot of time in preparing a wide variety of ingredients of the seasons in not only our entrees but in our popular Domo side dishes. The side dishes served at Domo are a specialty and are not available at any other Japanese restaurant in Denver. Over the years, our customers tastes have changed and currently Domo's new favorite are Japanese noodles! Domo serves a large variety of ramen, udon and soba noodles and today over 30% of all of our orders for both lunch and dinner are from our noodle menus. The secret to Domo's noodle dishes are the broths the noodles are served in. Our Domo soup stock is made from fresh vegetable selections, shiitake mushrooms and kombu seaweed, seasoned and simmered for 4 to 5 hours! Unlike other restaurants, we never use pork or chicken bones to make our soup stocks at Domo. Pork or chicken can be added by request per order, but our base soup stock contains no meats or meat products. All of our noodle bowls are also available as a combination entrée with a mini bowl of teriyaki, sashimi, etc which are a special favorite with all of our Domo customers. Check out our Lunch Noodle and Dinner Noodle Menus to see what Domo has to offer! Now that the season turns toward winter, join us for a hot and delicious bowl of noodles with family or friends and experience the wonders of this Japanese fall tradition…Domo style! Author of The Folk Art of Japanese Country Cooking; A Traditional Diet for Today’s World. Dine at Domo and Feed the World News Update! This year, Domo Restaurant, in conjunction with Nippon Kan AHAN, has focused humanitarian support efforts on the building of an orphanage facility for Myanmar Karin tribe refugees outside of Takoran village near the Thailand-Myanmar border in Thailand. The orphanage facility named Bilay House, currently under construction in Thailand, has been exclusively funded by Domo Restaurant and Nippon Kan Culture Center. This new facility will house up to 25 children and will include sleeping quarters, a dining and study hall, kitchen and shower facilities. Domo Restaurant is a social business of Nippon Kan Culture Center and our Domo patrons have provided a tremendous amount of support for this project this year, just by dining at Domo. In September, Gaku Homma, Domo Owner and Head Chef and a staff of four, traveled to Thailand to join the Thai construction crew in the building of this facility. 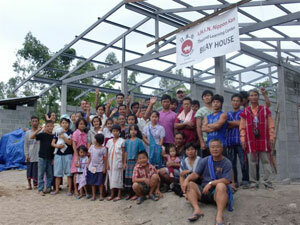 The opening of the Bilay House Orphanage is scheduled for December of this year. Your continued support of Domo Restaurant will go toward the completion of the Bilay House Orphanage in Thailand and other AHAN humanitarian projects around the world! 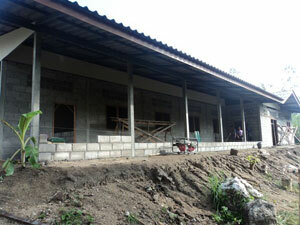 Bilay House Orphanage, Takoran, Thailand Opening December 2011! Domo restaurant plays a role in AHAN, the international humanitarian branch of Nippon Kan. One of the ways that Domo supports AHAN is through our campaign "Dine at Domo and Feed the World". This video was shot at the Yadanapon temple orphanage in February of 2011 in Yangon, Myanmar. AHAN International has been supporting the Yadanapon temple by supplying rice, medical and educational supplies for the last four years. On this trip, we discovered that Lego make a wonderful toy as well as educational tool for the children under our watch. In the past AHAN has supplied crayons, pens, paints and paper for children in need all over Asia, Central and South America and the Middle East. Crayons and paper are effective in developing creativity and motor skills however these supplies are all consumable and eventually outlive their usefulness. The Lego however can be used over and over again for years to come. 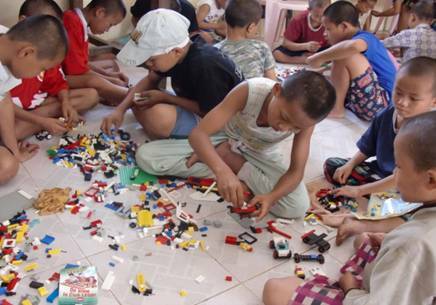 This year we began the "AHAN Lego for Learning Campaign", encouraging students to check for old Lego sets no longer needed at home and collected over 2000 pieces to take to the orphanage in Myanmar. At first the children were puzzled; they had never seen Lego before. It took only moments however before all of the boys were focusing with great concentration on building wonderful Lego creations with imagination and skill. The project was such a success we have decided to extend the program to children in Bangladesh and the Philippines as well. We are hoping that our customers at Domo will be able to help with this effort by bringing to Domo any old Lego sets you might not have use for any more. Even if you do not have any Lego sets at home to bring in, PLEASE PASS THIS MESSAGE ALONG TO FAMILY AND FRIENDS WHO MIGHT LIKE TO JOIN THE EFFORT! We would appreciate your help, but this time we are looking only for Lego. Other toys can be difficult to transport or might need batteries which are not readily available. For these reasons we are only accepting Lego and hope you will join us in our "LEGO FOR LEARNING" Campaign. A wonderful way to introduce your kids to traditional Japanese culture and cuisine with Nippon Kan's Chidren's Cultural School Field Trip program. Ask your teachers about signing up for a fieldtrip! Click here for more information. Enjoy the traditional Japanese foods at Domo and right next door, experience the traditional Japanese Martial Art of Aikido! Beginning Class Schedule for 2011 is available here. No time tonight to dine out at Domo? Then dine IN with Domo' s Express take-out menu for lunch and dinner! Domo Restaurant now features our Domo Express Take-Out Menu for lunch and dinner. 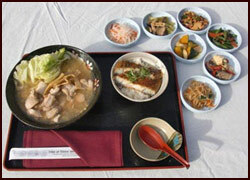 All entrees include three of Domo's famous country side dishes, miso soup and brown or white rice with barley. Order by phone or come in to order a delicious Domo meal to go! Domo Express Take Out is available during regular business hours Monday through Saturday. Domo's customer service questionnaire is online! Customer comments are now welcome ON LINE on the Domo website. Enter to win and let us know how your experience was at Domo. Domo Restaurant has been named in Zagat's National Restaurant Review's America's Top Restaurants 2009! Celebrating those who are making a positive difference in their communities and beyond. 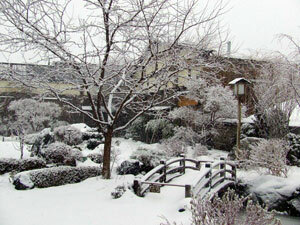 Domo Restaurant is part of Nippon Kan Culture Center and a partner with AHAN (the Aikido Humanitarian Active Network). For more information on Nippon Kan classes and activities in Denver, and AHAN humanitarian projects world-wide, www.nippon-kan.org and www.aikidoforbeginners.org. Monday–Sunday: 11:00 a.m. – 2:00 p.m.
and 5:00 p.m. – 10:00 p.m.